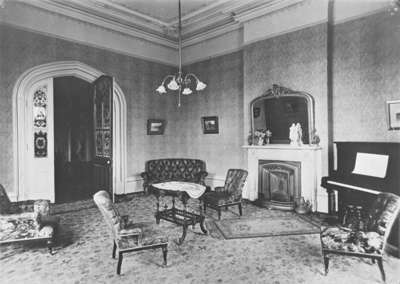 This is a black and white photograph of the Ontario Ladies' College reception room. There is an upright piano next to the fireplace. On the mantle of the fireplace is a mirror and a couple of figurines. There is a rug on the floor, a table, chairs and a couch. As well there are some pictures on the walls. Crown moulding is on walls and ceiling. The doorway to the reception room is open. There are decorative panels on the door. The reception room is located in the south-west corner of the main college building. Ontario Ladies' College Reception Room, c.1925, James and Sons. Whitby Archives 23-000-218.